All of our Green Mango, #11 and Haden, came from this small fishing village in Belize. Barbacoa - It's not just for meat! 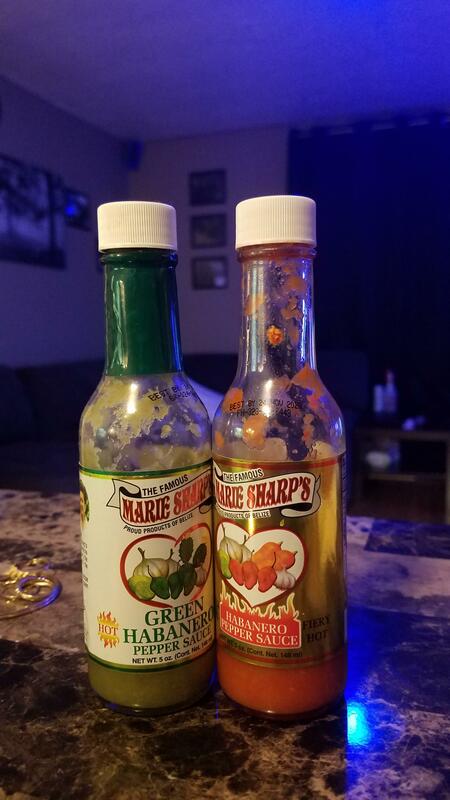 Marie Sharp's makes the world's finest condiments in the Stann Creek District of Belize, Central America. 100% Plant-based recipes made from hand-harvested, whole fruit and vegetables grown from non-gmo seeds in a sustainable, pesticide-free environment. All Ingredients are indigenous to the foothills of the Mayan Mountains. "Probably one of the tastiest Hot Sauces I’ve EVER had!!!" "Yummy and delicious line of authentic hot sauces, each one delightfully unique with a distinctive flavor, taste, and level of spiciness. Please pass the hot sauce, but not just any hot sauce; please make sure it's Maya Mike's Belizean Barbacoa! Add a kick to your other condiments, sauces, and salad dressings as well as a variety of spicy dishes or add their mild hot sauce (white label) for a flavor boost, minus the heat. I'm hooked on all of 'em. Best be extra nice to me, or I may not be inclined to share! 😃 Buy your own bottle(s) at MayaMike.com and enjoy!" "Really great flavor and heat profiles! I got all three for me and a couple more as gifts. Will definitely get more as my stash decreases!" "I enjoy the variety of flavors and heat and like to use as a marinade for meat and veggies on the grill; the rich, smokey flavors add kick to any meal. I highly recommend all of them!" 4.7K Views · Watch Roger March 23, 2018 · Belmopan, Belize · Roger Hale of Lamanai Chocolate drinking Belizean Barbacoa sauce! "...I am going to drink it, oh that's good! If you want something extremely delicious, but very different, then this if for you!" 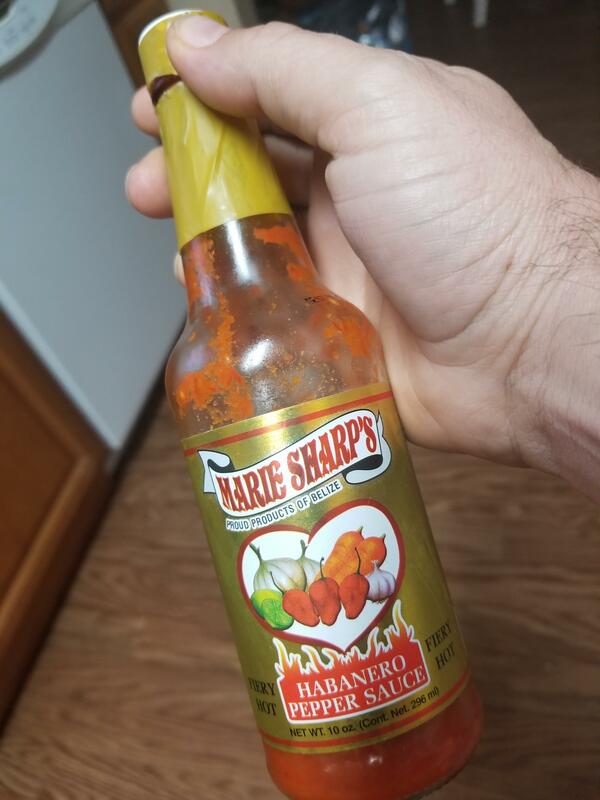 I think the standard white label "Hot" version of Marie Sharp's is the most versatile sauce I've ever had. I think all of their sauces are good, but when the sauce has fresh fruit in it, it's not even fair comparing it to most other mass-produced sauces. This lady is totally crushing it, and people are on here saying Cholula, or El Yucateco, or whatever is the best sauce? If you want hot for the sake of being hot, there are a million sauces that can do that. But this one has the best taste. I am addicted to this woman's hot sauces. I actually spoke to her a couple of years ago about getting bulk delivery. She was so sweet. My favorite is the Grapefruit Pulp Hab, followed by the one you are holding. I buy them ALL, and am stressing out about the fact that I am down to two bottles. I love the Sweet Habanero on pork chops. I know I am mentioning a lot about non-carrot based Marie's....I am just sooooo addicted to her sauces, I am glad someone else is too.